Yes, beet, not beef! carpaccio! (Huh? That just means it's thin slices of cooked beet, not thin slices of beef.) And isn't that just the prettiest salad ever? And it's sooo easy! And soooooo good!! And -- it's a great way to use my brand-new benriner, the one recommended by Karen from FamilyStyle Food who seems to 'get' me whether it's cookbook recommendations or food finds or now, kitchen tools. 2010 UPDATE Looking for My Favorite Way to Roast Beets? It's now a photo tutorial! 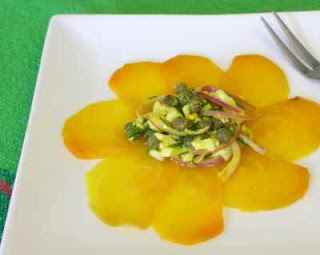 Arrange thin slices of beet on plates. Mix remaining ingredients and arrange on top. Serve immediately. Absolutely gorgeous! I love roasted beets, and this looks easy and yummy. I just got my money back from OXO, and now I'm 100% satisfied. Fabulous! I'll have to try this sometime in the summer, it's so beautiful. Yum! We planted the garden this past weekend, and golden beets were among the plantings...now I'm really hoping they take off! You just discovered golden beets! Well, me too just last year. They are so lovely. And I love them roasted like you're doing them. I love this, it looks like a little flower! Oh, I love beets! This looks amazing. Maybe I'll get the behringer. The salad is gorgeous, and I love beets! I also adore my benriner, but use that finger guard religiously if you like your fingers the length they are! It's VERY tempting not to, but be strong - your finger tips will thank you. Wonderful recipe! I never think of using beets this way, but they look gorgeous. Karen ~ Thanks to YOU for the Benriner! Deinin ~ I love how all these comments start with, um, !!! Erika ~ Good for you, those will be fabulous! Ari ~ Pretty and yet unfussy to make, imagine! Lisa ~ I do much recommend the Benriner, I've tried so many tools that just don't work. Timothy ~ I suspect you're right about the finger guard. One slip and oops, the golden beets are a real mess (to say nothing of the fingers). And you're right about it being tempting not to use it.